How About Some Infrastructure Spending? The failure of a single piece of equipment in Yuma, Ariz., ignited a massive blackout that left more than 4 million people without power, baffling utility officials and highlighting the vulnerability of the U.S. electrical grid. 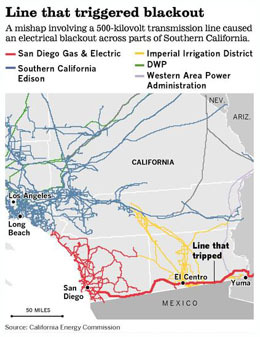 Authorities in Arizona said Friday that safeguards built into the system should have prevented the breakdown at a Yuma substation from cascading across southern Arizona and into California and northern Mexico. They didn’t, and the resulting instability led to the sudden shutdown of the San Onofre nuclear power plant, cutting off power to a large swath of Southern California. The proximate cause remains unknown, but I’m going to take a guess and say that the ultimate cause is an aging electrical grid that’s increasingly unable to handle big loads and small failures. This problem is hardly unique to the United States (Europe has suffered half a dozen blackouts as big as Thursday’s in the past decade), but that’s no reason to be complacent about it. If only we could pony up lots of cheap money to do something about this. But from where? It would have to be, oh, I don’t know, some kind of nationwide infrastructure bank or something, sponsored by some entity that can issue long-term bonds practically for free. Just a pipe dream, I guess. Nothing like that exists. Luckily I have plenty of spare battery-operated lanterns around.